Performance toner with eucalyptus, lactic acid, and salicylic acid. Salicylic Toner eliminates breakouts and congested skin by delivering an antimicrobial property of eucalyptus oil. This extraordinary ingredient allows skin to repair rapidly and safely without irritation or redness. Eucalyptus oil fights against bacteria, particularly P-acne, which is 90% of what contributes to the onset acne. P-acne is short for Propionibacterium, which is the reason for breakouts, acne lesions, cystic acne, nodule cystic acne and congested skin. To reduce and/or eliminate the productivity of P-acne, skin care products must be balanced to the skin’s pH. 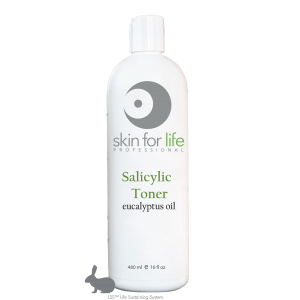 Salicylic Toner has a pH 5.0, which is extremely safe for treating oily, acne and troubled skin conditions. It is important that skin has a balanced environment to repair and recover for long-term skin health. Skin for Life’s performance ingredients are safe and effective for skin correction. This performance treatment toner is a BHA/AHA toner. Beta Hydroxy Acid (Salicylic Acid) and Alpha Hydroxy Acid (Lactic Acid) are extremely beneficial when providing a proper daily exfoliation without the concerns of over cleansing. The primary benefit of this skin care product and why it is a popular oily/acne toner is its antimicrobial properties of eucalyptus oil and salicylic acid. These active ingredients are performance driven and result oriented. However, we have formulated a safe and effective 5.0 pH so even the most oily sensitive skin may use Salicylic Toner. We have also included lactic acid to provide the skin with a thorough surface exfoliation. Lactic acid works in unison with the driving properties of eucalyptus and salicylic acid. This skin care product provides surface exfoliation while enhancing receptivity for skin correction. Use morning and night as a pretreatment skin care product. Apply a generous amount on a moistened cotton round after cleansing on dry skin. Pat dry and proceed with one of our Skin for Life’s serums, moisturizers and sunscreens. Recommended twice a day for two-weeks and once skin is balanced use once a day to maintain skin performance. For transitory blemishes that may occur during or before menstrual cycle Salicylic Toner may be used as a spot treatment until problem area has healed. After thorough cleansing apply Salicylic Toner to face, neck and décolleté. Apply a generous amount of Salicylic Toner to a moistened cotton round. Remove residue from facial cleansing with moistened esthetic gauze or compressed sponges. Reapply Salicylic Toner for the next step to increase product penetration.